It's heartening to know that, after years of community education, Australians are really embracing the message of pet adoption. It means that for many prospective pet owners, like Michelle, adopting a rescue dog is becoming the first and only option they would now consider. "We loved the idea of giving a home to a pet in need and began searching the pages of PetRescue to suit our breed preferences and lifestyle choices,” says Michelle. "I grew up with a Ridgeback x Rottweiler called Tiger, and was hoping to find a similar medium-to-large breed, with the same temperament and energy levels." 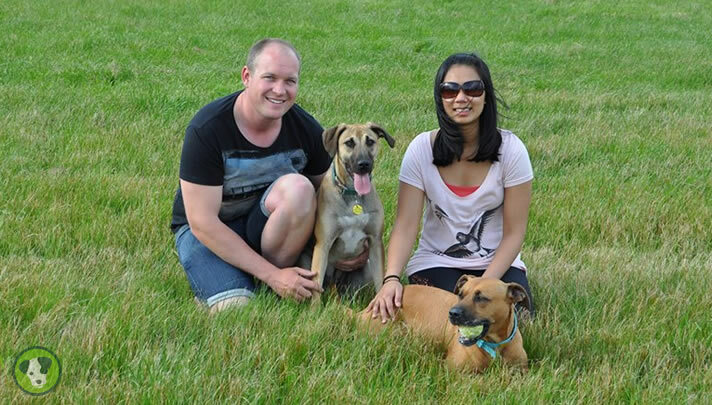 Newly-weds Michelle and James appreciated the help and support they received from PetRescue and foster staff in making the whole selection and adoption process easy and affordable. “We were impressed that all pets are temperament tested, vaccinated and desexed too,” says Michelle. When the couple first saw Luna's PetRescue profile, listed by Blue Plus Animal Rescue, they were instantly taken by her chilled-with-not-a-care-in-the-world temperament and applied to adopt. Once accepted, Michelle jumped on Google to search for names and came upon 'Luna' which means moon in Latin. "Luna was a very shy and timid puppy when we picked her up from the rescue group, but quickly made herself comfortable in the car,” says Michelle. “And when we arrived home, she was very excited, wagging her tail, running around, exploring the house and not at all phased by the presence of my Mum’s dog Tiger at all. It was a relief to see her settle in and adapt to our home and lifestyle so quickly." Luna fitted into her new surroundings like a glove, and her playfulness has brought a special energy and dynamic into their home.